Music of Dvorak, Bartok, Shor, and Walton. 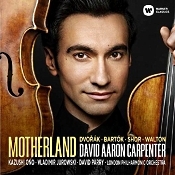 David Aaron Carpenter, viola; Vladimir Jurowski, Kazushi Ono, David Parry, London Philharmonic Orchestra. Warner Classics 0190295697693 (2-disc set). David Aaron Carpenter is a relatively young (b. 1986) American violist who has been making a name for himself as a concert soloist these last few years. He began studying the violin when he was six and the viola when he was eleven, attending the Juilliard School, the Manhattan School of Music, Italy's Accademia Chigiana, Switzerland's International Music Academy, and the Verbier Festival Academy, studying with Pinchas Zukerman, Roberto Diaz, Seiji Ozawa, Robert Mann, Nobuko Imai, Boris Belkin, and Yuri Bashmet. 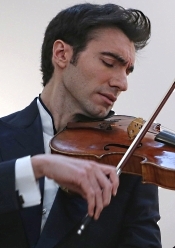 By 2003 he was performing with leading orchestras and conductors throughout the world, and in 2006 he was the first Prize Winner of the Walter W. Naumburg Viola Competition. "Motherland" is Carpenter's sixth major album and his second for Warner Classics. It's a combination of the old and the new, the familiar and the more unfamiliar. The first disc of this two-disc set begins with the old, Dvorak's Cello Concerto, although even that is somewhat new in that Carpenter plays it in an arrangement for viola. Next is Bartok's Concerto for Viola, followed by something a bit newer, Alexey Shor's Seascapes. Disc two gives us Walton's Concerto for Viola, followed by two more works by Shor. The pieces provide a healthy, varied, and attractive program. Czech composer Antonin Dvorak (1841-1904) wrote his Cello Concerto in B minor, Op. 104 late in life, between 1894-95, his last concerto work. Yet even that is slightly different since Carpenter performs it as arranged for viola by J. Vieland and Carpenter, with accompaniment by Maestro Kazushi Ono and the London Philharmonic. Aside from the novelty of hearing the cello part played by a viola (which takes a moment or two to get used to because you don't get as sonorous or mellow a sound), the performance appears good but not extraordinary. It's well prepared and well executed, but I found it a trifle routine. And in the slow movement the viola doesn't quite convey the kind of melancholy a cello can impart. Still, the combination of Carpenter's enthusiasm, the viola's vibrant, youthful tone, and the excellence of the orchestra make it worth one's time. Disc one ends with a short piece in four parts called Seascapes by Ukrainian-born composer Alexey Shor (b. 1970), who now resides in the U.S. Here, Maestro David Parry and the London Philharmonic accompany Carpenter. Although it may be a modern work, it doesn't sound like one. It's filled with dancing melodies and lively, mostly cheerful tunes. Carpenter's treatment of it makes for a delightful listen. Disc two contains only three works, one by English composer Sir William Walton (1902-1983) and two more by Alexey Shor. The Walton piece is his Concerto for Viola and Orchestra, written in 1929. The Shor pieces are the brief Two Songs for My Children and the lengthy Well Tempered Chanson. Jurowski leads the London Phil accompanying the Walton piece, and Parry again conducts the orchestra in the Shor works. As on disc one, Carpenter displays a command of the music as well as of the viola. The musical lines are always clear and clean, as well as the performer's conviction. Overall, I'm not sure Carpenter shows us anything new, but it's good to know there are accomplished musicians ready to assume the mantle of an older generation. Producer Andrew Walton and engineer Deborah Spanton recorded the music at Saint Augustine's, Kilburn and Lyndhurst Hall, Air Studios, London, England in 2017. As with many of the recordings made in Lyndhurst Hall, especially, the sense of orchestral depth is quite good, adding to the overall realism of the sound. There are also good dynamics and a moderately wide frequency response. Transparency is more than adequate, and the extremes of bass and treble seem reasonably well extended. In other words, we have fairly lifelike sound, making the set a pleasure to listen to.